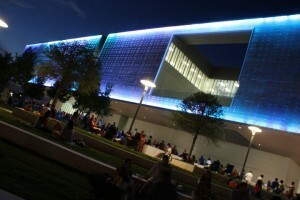 The new Curtis Hixon Park was designed by New York based design firm Thomas Balsley Associates. Over the past decade, Tampa’s downtown has changed dramatically. The development of new museums, restaurants and condos has created an urban area where residents can work, play and live. 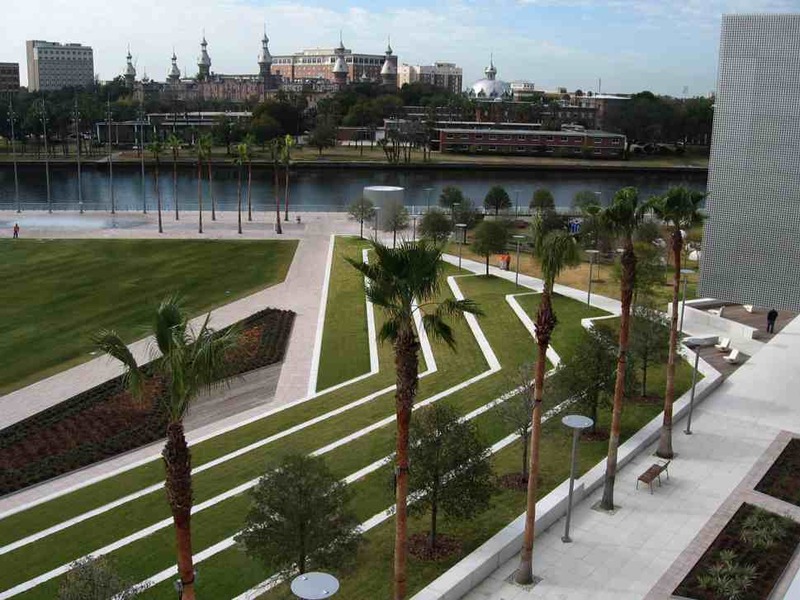 And now thanks to the reinvention of Curtis Hixon Park, Downtown has urban, outdoor area to compliment the growing neighborhood surrounding Tampa’s heart. The 8-acre park, located between Ashley Drive and the Hillsborough River, has been completely renovated over the past year. New features such as a modern children’s playground, gated dog park and interactive water fountain were added, and the landscape has been altered to allow for maximum utilization of the space. Wide, cascading grass steps lead into an open field large enough for full on game of football, while the steps designate space for lounging and relaxing away from the chaos. And for a virtual glance, please view this beautiful video showcasing Downtown and Curtis Hixon Park brought to you by Chad Soriano. 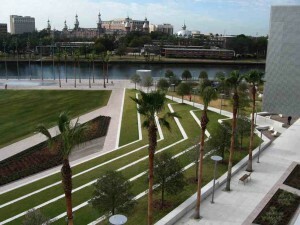 And Curtis Hixon Park is more than a grassy piece of urban eye candy. It is also a growing location for community events and activities. Check out a few of the amenities and ongoing events at Tampa’s newest natural addition. The menu at Sono Café, which is operated by Mise en Place of Tampa, is Italian inspired and offers wines, desserts, coffees, salads and yes, even PB and J. So forget your park picnic and stop into this waterside café for lunch, snacks or drinks. Click here for a full menu. Sono Cafe also features artisan gelato from Gelateria del Duomo which won the 2010 Best of the Bay award for Best Artistic Gelato! On the first Thursday of the month Curtis Hixon hosts Rock the Park, a concert series showcasing local musicians. One of the great things about the event is that you can be as close or as far from the music as you like. The stage is set up on the breezeway leading up to the Tampa Museum of Art and lined with chairs so if you want to be front row and center, you can. But if you’d rather watch from afar, there is plenty of lawn space to choose a distance fit for your preferred listening volume. And because no concert is complete without a few drinks, a refreshment stand is available to help you quench your thirst with a soda, a water bottle or a beer. Don’t miss the next show. Connect with Rock the Park on Facebook for updates on upcoming concerts. Follow the Tampa Downtown Partnership on Twitter and Facebook to find out more scheduling details. Happy Buddha Yoga Lounge hosts a sunset yoga session at Curtis Hixon Park on Sunday evenings. Before you jump back into a week filled with work and classes, visit the park for a Sunday sunset yoga class provided by Happy Buddha Yoga Lounge, a yoga studio located in Downtown. The session starts at 6 p.m. and is free to all attendees. Check out their Web site for a full class schedule or visit their Facebook page for more details. 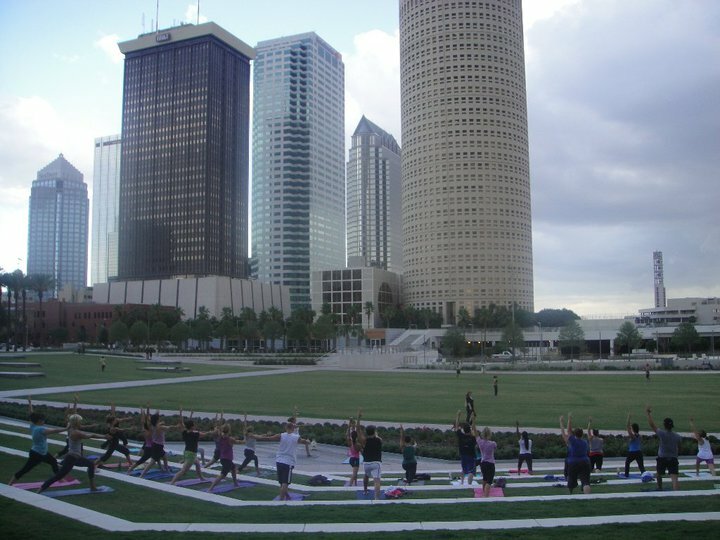 Whether you’re looking to listen to live music, find your center at a yoga class or simply relax after a busy day, Curtis Hixon Park has room for it all.